So let us first talk about what happens when we have an out of balance thyroid. What are the warning signs of those, and how can we take a preemptive approach to address any sort of potential hormone imbalances? What tests should I be looking at? And finally, how to make sense of the lab results! 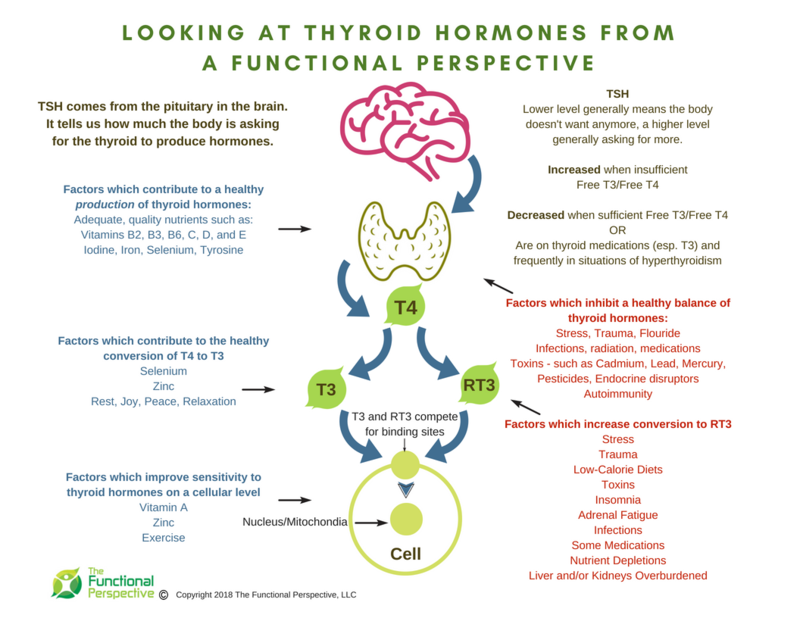 When our thyroid hormones are out of balance, a whole cascade of events happens. What many do not realize is that a lot of things have been going on under the surface before the thyroid gets out of balance. So, by the time we see that our hormones are abnormal on the conventional test, there have been a lot of clues that have been missed in the conventional medical world. This is because the tests are not really designed in the conventional world to take a preemptive approach or preventative approach, rather they are to identify a diseased state. Everything leading up to the disease is disregarded. There are two sides to that. So, the first side real quick is that the normal is really what is common, or what is found the most. This is not a range which determines health and vitality. They are looking for a critical state – a disease state. Disease is at the end of the equation – it is what happens after things have broken down to the point a label can be assigned. Until that point it is just chaos happening. This is a very important concept to understand. The conventional model is an acute care – emergent care model – it is not equipped, nor are the providers trained for addressing chronic health issues. So we have to take a different approach to a chronic health situation unless we are content with an acute care outcome – getting a pill, surgery, or other invasive intervention to treat symptoms, not the cause. The other side of this is to look at the data from a functional perspective and one that looks at values and how they relate to health, vitality, and rejuvenation. Do these ‘normal’ values mean they are healthy values? No, absolutely not. Generally speaking, a middle of the range is usually more of an optimal healthy range. There are exceptions, sometimes it is at one or the other end that is ‘healthy’. But in all instances, we have to put them into context. 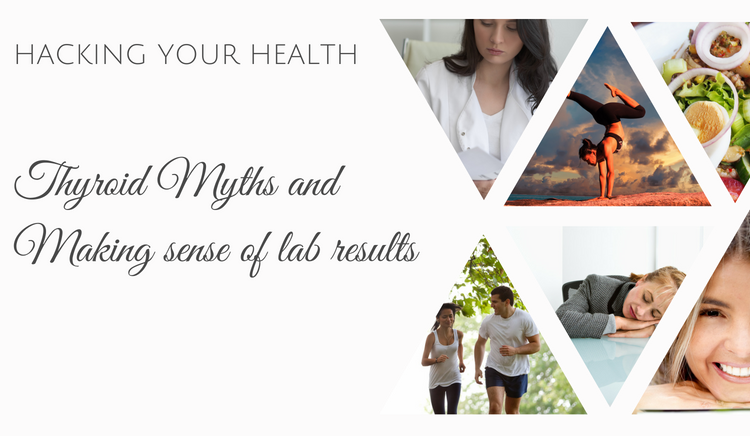 We have to look at these things differently and approach these test results differently if we want to really take charge of our health, especially to reverse some of these chronic illnesses such as autoimmunity and hormone imbalances. The quick-reference chart below shows us the factors which contribute to a healthy level and factors which create an unhealthy level. (I will get into more details in a moment) When I see hormonal imbalances the first thing I am going to explore is looking at the co-factors and opportunities for improvement as well as are there other areas which are compromised and shifting the conversion to that sympathetic state? With that, I note our thyroid is dependent on a healthy GI tract so when our digestive system is compromised for long periods of time, there will be an effect on our hormones. 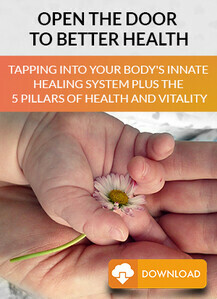 Hormonal imbalances are nearly always downstream from digestive imbalances. 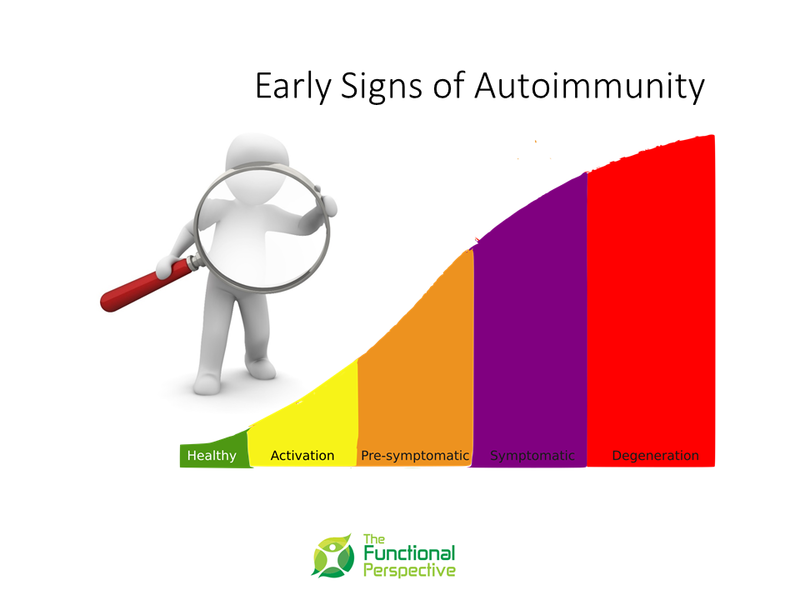 Lastly, if we can identify the warning signs we have a much greater potential to head off autoimmunity before it takes over. The thyroid hormones play a huge role in our energy production. In the Activation and Pre-Symptomatic stages is where we see these symptoms start to emerge, or we see things like frequent illness, frequent periods of high-stress, exposure to toxins, pathogens, and other things which elicit an immune response. When don’t have energy, then we are going to be fatigued, we’re going to get irritable, we’re going to have unexplained weight gain. The cycle leads to more and more symptoms. It becomes difficult for us to maintain a healthy weight, and then we are going to be tired even more. We are going to feel cold. Our temperature regulation is going to be off. Many times there’s going to be things such as depression, and dry skin, and even constipation. So, those are some of the top signs that our body is trying to tell us: “Hey, there’s something going on inside. I have a battle going on and right now the thyroid hormone production, utilization isn’t one that is promoting a parasympathetic, peaceful, rest and digest state”. When we see these clues a thyroid imbalance and autoimmunity, Hashimoto’s, those kinds of things could be on our horizon. Before we get any further, I want to just talk real quick here about feeling cold, and the temperature regulation irregularities. So, the thyroid it not only helps with our energy, like having energy to do things, but also that energy which translates into our body temperature. That is one of the best ‘tests’ that we have where we see what is going on intracellularly with the thyroid hormones. All of the lab tests that we have tell us more things are going on outside the cells. There is no test that can get inside the cell and tell us okay, hey, how is this thyroid hormone actually working inside the cell? The intracellular test that we have is our body temperature. When energy is produced there is heat involved in that, that is how we can tell what’s going on intracellularly with our thyroid. So, of all those things, the checking pf our temperatures can be done at home. You don’t need to go to a doctor for that, we don’t need to go to a lab, or order some special lab. You don’t need insurance for any of that. 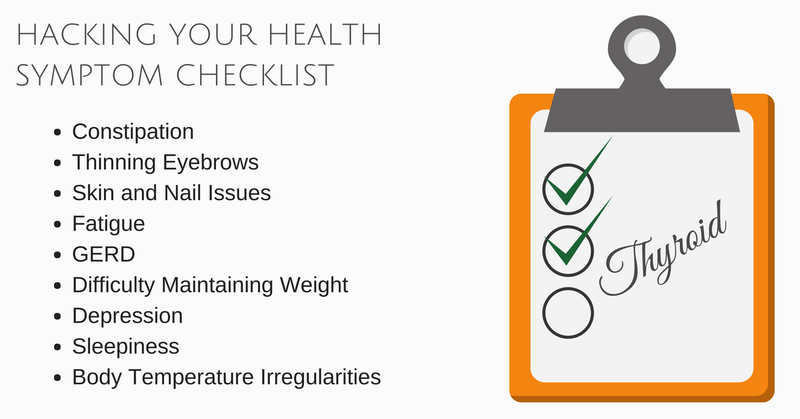 Just get a really good thermometer. Ideally, the old time mercury type thermometers that you can check your oral temp. You need to hold it for quite a long time. A lot of times the digital ones are not quite as accurate for what we need for that basal temperature. Charting your temperature, which you can download a chart HERE to help track back to see, hey, do I potentially have some problems here? There are going to be some fluctuations. There are different patterns that we’re going to see throughout the day of high and low, but there still is a good healthy range that we should have, and there’s going to also be a range based on what is the difference between your highest and lowest. It’s not just where you’re at on the chart, but how much of a difference in range are you seeing throughout your day. All these things are different clues for us as clinicians to look at. The temperature one is one of the number one things and top of my list that I always explore, and I always ask about whenever I’m looking through history to see, okay, what are the temperatures? What all is going on here because that’s going to tell me more about what’s going on with the thyroid hormones on a cellular level. Which this leads to the question of Why? I’m always going to ask the question ‘why?’ If we know that we have a temperature that is off, the next question is why is it off? Because just when we get a diagnosis from the conventional world of saying, hey, you’ve got this disease that doesn’t really tell us what really is going on. The diseases are at the end of the equation. What I do, and what those who are approaching health functionally, holistically, and from a naturopathic perspective, we are looking way back at the beginning saying, okay, what are the building blocks and why do we have a problem? The disease is just a label given by the conventional world so that you can be prescribed medications or a pill or some sort of surgery, something for that. It doesn’t really get to why, and that’s why we come away from our doctor appointments frustrated and spinning in circles. We are trying to fit a square peg in a round hole – it just isn’t going to work! That’s a whole other topic that I’m not going to get on, but let’s go to the question of why. So, why is there an imbalance, why is there a problem with the energy production? That’s where we’re going to look at several key things. The first thing that we’re going to look at is what is the environment like? This boils down to genetics and epigenetics. We have our genes, and those are the building blocks that we were given. Our genes don’t mean everything we can influence our genes and how they express themselves, and that’s the epigenetics. That’s going to basically be everything around us, the ‘environment’. This is where the detective work begins and things start to get exciting as we uncover clues and find those long lost missing pieces! We’re going to look at toxins. Are there things that are slowing down our system, that’s making our body have a difficult time in producing hormones? Because the hormones are secondary. Our body has two systems. We have the parasympathetic state, and the sympathetic state. Those epigenetics are going to determine which state our body is going to be in. Is it going to be in that sympathetic state, which is that fight or flight mode? That is the state of our body is running from a lion, it’s going to do whatever it needs to do to get us to safety. It doesn’t matter if it’s a lion, it doesn’t matter if it’s toxins, it doesn’t matter if it’s somebody at work upset us. All those things engaged our sympathetic state. Our body can perceive a lion. When you see a police car behind you with flashing lights there is a sympathetic response from our body – that surge of hormones that has us wondering – Was I driving too fast? Did I forget to use my turn signal? As soon as they speed on around us we start to return to normal – we return to the parasympathetic, rest digest, repair, and peaceful state. But, how many of you take a while to calm down from a ‘false alarm’? That is a clue about how our body is able to clear out hormones after they have ‘done their job’. When those things linger it creates what I often refer to as a clogged up toilet. Our elimination system is a bit overwhelmed and needs a little support. It is those sort of daily stressors which put our body into that mode that wears heavily on our body. It is those things which our body perceives as a threat and engages our survival mode for extended, or frequently throughout our day that it becomes problematic. This is the beginning of chronic illnesses. We NEED both states – balance is the key. If we are constantly running from a lion that is problematic, if we DON’T run from the lion – that is just as problematic! When our body is in that fight or flight mode, that’s where it’s going to divert things too. The thyroid is really used for replenishing for that rest and health. There is an energy component, but our body, the adrenals are going to use that stuff much faster than what our body’s going to replenish. And it’s going to divert things from our GI tract to go get us out of danger. We need blood flow in our GI tract working really well for our hormone production. When we divert things from that, it’s going to change how foods are handled, there’s going to be a domino effect on our hormones, on our neurotransmitters, on how we’re digesting foods. Things such as, are we getting the nutrients from our food to use to make those things? We can’t get the nutrients from our foods if we’re diverting the blood flow from our GI tract. That is how it gets all intertwined and eventually things fall apart. When we get labeled, and we get shuffled from this specialist to another specialist in the conventional world and they’re looking at things all independently. So, your endocrinologist is not looking at your GI tract to see, hey, are you digesting food? Are you getting your nutrients from your foods so that your body can make these hormones and do those things? No, everything’s put in its own little box and it is all compartmentalized. With the hormones, whenever we have these thyroid hormones out of balance, we have to look upstream because there are so many things that happen upstream that are going to affect positively or negatively the balance that our body is going to have when it comes to the hormone regulation and thyroid hormone regulation. Some of the other things in the environment that we’re going to look at besides things such as toxins, are there heavy metals, do we have a deficiency in vitamins and minerals? Are there parasites and things that are messing with and disrupting our homeostasis and a healthy balance in our digestive tract? There are several links below to studies which get into the microbiome and our hormone regulation. Especially how important bile is to maintaining a healthy balance. I always encourage getting on PubMed to find information to help connect the dots on our health challenges. The liver plays an integral role in thyroid hormone regulation. The liver is where conversion happens and where the elimination of toxins and other things which adversely affect thyroid levels. So, if we don’t have our liver working well, and we’re missing what some building blocks that come from our body, we’re not going to have good conversion, and we get into a catch 22 scenario real quick! As those things go on and on, then the body is now trying to get what it needs from alternate ways and it puts it in that state of stress. Long-term stress keeps it in that sympathetic state, but then it becomes self-perpetuating when that stress, when it keeps going on and on. We were never meant to run continuously from a lion. Either, we ran away for a short distance, got away from the lion, or the lion gets us. But either way, the chase is over. The chase was never meant to go on endlessly. In our society, especially here in the US, and a lot of these industrialized societies, it’s nonstop that we are going and going and going and going. That wreaks havoc on our body. And that is where we see a lot more chronic health issues. We are putting toxins into our body. We are injecting toxins, we are eating toxins, we are surrounded by toxins, these things disrupt a healthy balance of our hormones. Those are the questions that we are going to look at to answer that question ‘Why is there a hormone imbalance?” Then we address those things. We’re going to look for opportunities to see where we can say, “Hey, yes, there is this great toxic exposure, we need to eliminate that” or, “We have these nutrient deficiencies. We need to fill those deficiencies.” We always start with the foundation, and we want to make sure that we are getting good quality clean foods which can be very difficult here in the US. It is really important that we are putting in good quality fuel into our bodies just as we would put in good quality fuel into our cars. We would never intentionally put water in our gas tank, and we would never intentionally put tainted gasoline into the gas tank of our cars. The same thing with our bodies. If we expect our bodies to run optimally, we have to provide it with good fuel, and to clean up anywhere where there are problems. We need to make sure that we are taking care of our body just as we would our vehicle. First – we get a signal from our pituitary. When the signal comes it is the body’s way of telling us, hey, I need more T4 hormone or, you know what, I’ve got enough T4. Then the T4 converts and either heads down the path of T3 or Reverse T3. You can see some of these things that are shunted over to the reverse T3 like the chronic stress. We get into that stressful state, our body is going to put it over to that reverse T3. Here’s why that is important – because the reverse T3 and the T3, they compete for the binding sites on the cell. So, when we have reverse T3 on the binding site less of the T3 will get through, which equates to our body not being able to produce as much energy. So, we have got to make sure we don’t have too much excess or too much of the reverse T3 because that’s where we’re going to have problems. The tests that I always recommend for those who are having chronic thyroid issues and for those who are just not feeling well, is to say ask your provider for a full thyroid panel. That’s going to be your TSH, which is your thyroid stimulating hormone. It’s going to be your T3, your T4, your free T3, and your free T4. As well as your reverse T3 and total T3. You want the entire gambit plus you’re going to want the antibodies, the TPO antibodies to see, is my body making attacking these thyroid hormones. That’s going to give you a pretty big picture of what’s going on with your thyroid, versus the general test most look at which is TSH. The TSH is basically like the light switch. Your body saying, hey, yes, I need more, or no, I’ve got enough. So, it’s turning on or off the signal. The lower number actually means that your body is saying, hey, I’ve got plenty. When it’s higher, it’s going to say, you know what, we’re needing more, turn up, we need more. It’s asking for more. It’s a very simple way to look at it. There are other nuances to that, and you really need to put it all in context, but that can get you started to help you look at, to understand a little bit more about what these tests are telling you from a functional perspective. The signs and symptoms our body is presenting with are how it communicates needs – listen to that inner voice and your ‘gut’ instinct! Reach out to a functional, holistic or naturopathic professional who can help you do the detective work needed to find and put the missing pieces of your health back together! Now you are equipped to start hacking your health and embark on the journey of re-defining Health’care’! I welcome your comments and questions and be sure to follow me on facebook. For mom’s and women battling with chronic digestive or autoimmunity I have a private facebook group – Moms Taking Charge of Digestive Health you are welcome to drop by!